Airport Authority Hong Kong (AAHK) commissioned Mott MacDonald Hong Kong Limited (MMHK) to undertake the role of Environmental Team (ET) for carrying out the Environmental Monitoring & Audit (EM&A) works during the construction phase of the Project in accordance with the Updated EM&A Manual (the Manual). This is the 21st Construction Phase Monthly EM&A Report for the Project which summarizes the monitoring results and audit findings of the EM&A programme during the reporting period from 1 to 30 September 2017. The key activities of the Project carried out in the reporting period included deep cement mixing (DCM) works, laying of sand blanket and geotextile, seawall construction, horizontal directional drilling (HDD) works, concrete removal works, piling and excavation works. The monthly EM&A programme was undertaken in accordance with the Manual of the Project. During the reporting period, the ET conducted 36 sets of construction dust measurements, 20 sets of construction noise measurements, 13 events of water quality measurements, 1 round of terrestrial ecology monitoring on Sheung Sha Chau Island, 2 complete sets of small vessel line-transect surveys and 5 days of land-based theodolite tracking survey effort for Chinese White Dolphin (CWD) monitoring and waste monitoring. Weekly site inspections of the construction works were carried out by the ET to audit the implementation of proper environmental pollution control and mitigation measures for the Project. Bi-weekly site inspections were also conducted by the Independent Environmental Checker (IEC). Observations have been recorded in the site inspection checklists and provided to the contractors together with the appropriate follow-up actions where necessary. On the implementation of Marine Mammal Watching Plan (MMWP), dolphin observers were deployed by the contractors for laying of open sea silt curtain and laying of silt curtains for sand blanket in accordance with the plan. On the implementation of Dolphin Exclusion Zone (DEZ) Plan, dolphin observers at 13 to 16 dolphin observation stations were deployed for continuous monitoring of the DEZ by all contractors for DCM works and seawall construction in accordance with the DEZ Plan. Trainings for the proposed dolphin observers were provided by the ET prior to the aforementioned works, with the training records kept by the ET. From the contractors’ MMWP observation records and DEZ monitoring records, no dolphin or other marine mammals were observed within or around the silt curtains, whilst there was one record of dolphin sighting within the DEZ of DCM works in this reporting period. Audits of acoustic decoupling for construction vessels were also carried out by the ET. 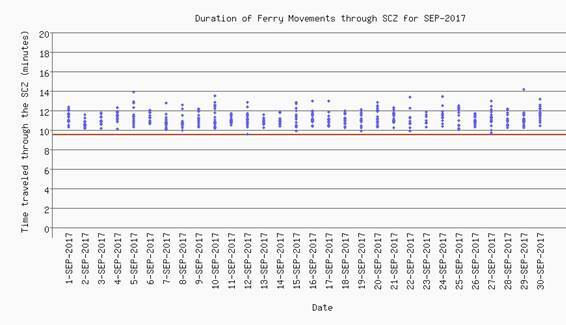 On the implementation of the Marine Travel Routes and Management Plan for High Speed Ferries of SkyPier (the SkyPier Plan), the daily movements of all SkyPier high speed ferries (HSFs) in September 2017 were in the range of 70 to 87 daily movements, which are within the maximum daily cap of 125 daily movements. A total of 580 HSF movements under the SkyPier Plan were recorded in the reporting period. All HSFs had travelled through the Speed Control Zone (SCZ) with average speeds under 15 knots (9.6 to 14.1 knots), which were in compliance with the SkyPier Plan. In summary, the ET and IEC have audited the HSF movements against the SkyPier Plan and conducted follow up investigation or actions accordingly. On the implementation of the Marine Travel Routes and Management Plan for Construction and Associated Vessel (MTRMP-CAV), the Marine Surveillance System (MSS) automatically recorded the deviation case such as speeding, entering no entry zone, not traveling through the designated gate. ET conducted checking to ensure the MSS records all deviation cases accurately. Training has been provided for the concerned skippers to facilitate them in familiarising with the requirements of the MTRMP-CAV. Deviations including speeding in the works area, entry from non-designated gates, and entering no-entry zones were reviewed by ET. All the concerned captains were reminded by the contractor’s Marine Traffic Control Centre (MTCC) representative to comply with the requirements of the MTRMP-CAV. ET reminded contractors that all vessels shall avoid entering the no-entry zone, in particular the Brothers Marine Park. 3-month rolling programmes for construction vessel activities, which ensures the proposed vessels are necessary and minimal through good planning, were also received from contractors. The monitoring works for construction dust, construction noise, water quality, construction waste, terrestrial ecology, and CWD were conducted during the reporting period in accordance with the Manual. No exceedance of the Action or Limit Levels in relation to construction dust, construction noise, construction waste, and CWD monitoring was recorded in the reporting period. The water quality monitoring results for DO, turbidity, total alkalinity, and chromium obtained during the reporting period did not trigger their corresponding Action and Limit Levels stipulated in the EM&A programme for triggering the relevant investigation and follow-up procedures under the programme if being exceeded. For SS and nickel, some of the testing results exceeded the relevant Action or Limit Levels, and the corresponding investigations were conducted accordingly. The investigation findings concluded that the exceedances were not due to the Project. The monthly terrestrial ecology monitoring on Sheung Sha Chau observed that HDD works were conducted at the daylighting location and there was no encroachment upon the egretry area nor any significant disturbance to the egrets foraging at Sheung Sha Chau by the works. ● Stockpiling of excavated materials from HDD operation. ● Prefabricated Vertical Drain (PVD) installation. ● CLP cable ducting work. ● Excavation and piling works. ● Removal of existing concrete. The key environmental issues will be associated with construction dust, construction noise, water quality, construction waste management, CWD and terrestrial ecology on Sheung Sha Chau. The implementation of required mitigation measures by the contractor will be monitored by the ET. A complaint on sand filling materials was received on 5 Sep 2017. Investigation details of the complaint is presented in S7.8.1. No notifications of summons or prosecution were received. Remark: ^Only exceedance of Action or Limit Level related to Project works is counted as Breaches of Action or Limit Level. Construction of the Project is to proceed in the general order of diversion of the submarine aviation fuel pipelines, diversion of the submarine power cables, land formation, and construction of infrastructure, followed by construction of superstructures. The updated overall phasing programme of all construction works was presented in Appendix A of the Construction Phase Monthly EM&A Report No. 7 and the contract information was presented in Appendix A. This is the 21st Construction Phase Monthly EM&A Report for the Project which summarizes the key findings of the EM&A programme during the reporting period from 1 to 30 September 2017. The Project’s organization structure presented in Appendix B of the Construction Phase Monthly EM&A Report No.1 remained unchanged during the reporting period. Contact details of the key personnel have been updated and is presented in Table 1.1. The key activities of the Project carried out in the reporting period included DCM works, laying of sand blanket and geotextile, seawall construction, HDD works, concrete removal works, piling and excavation works. The status for all environmental aspects is presented in Table 1.2. The EM&A requirements remained unchanged during the reporting period and details can be referred to Table 1.2 of the Construction Phase Monthly EM&A Report No. 1. The baseline air quality monitoring result has been reported in Baseline Monitoring Report and submitted to EPD under EP Condition 3.4. The baseline noise monitoring result has been reported in Baseline Monitoring Report and submitted to EPD under EP Condition 3.4. Completed in May 2017 and data analysis in-progress. To be submitted with the relevant construction works. The CAR for Golf Course was submitted to EPD. The Egretry Survey Plan was submitted and approved by EPD under EP Condition 2.14. The Coral Translocation Plan was submitted and approved by EPD under EP Condition 2.12. The coral translocation was completed. Baseline CWD results were reported in the CWD Baseline Monitoring Report and submitted to EPD in accordance with EP Condition 3.4. The baseline landscape & visual monitoring result has been reported in Baseline Monitoring Report and submitted to EPD under EP Condition 3.4. Taking into account the construction works in this reporting period, impact monitoring of air quality, noise, water quality, waste management, ecology, landscape & visual and CWD were carried out in the reporting period. The EM&A programme also involved weekly site inspections and related auditing conducted by the ET for checking the implementation of the required environmental mitigation measures recommended in the approved EIA Report. In order to enhance environmental awareness and closely monitor the environmental performance of the contractors, environmental briefings and regular environmental management meetings were conducted. The EM&A programme has been following the recommendations presented in the approved EIA Report and the Manual. A summary of implementation status of the environmental mitigation measures for the construction phase of the Project during the reporting period is provided in Appendix B. Air quality monitoring was conducted at 2 representative monitoring stations in the vicinity of air sensitive receivers in Tung Chung and villages in North Lantau in accordance with the Manual. Table 2.1 describes the details of the monitoring stations. Figure 2.1 shows the locations of the monitoring stations. In accordance with the Manual, baseline 1-hour total suspended particulate (TSP) levels at the two air quality monitoring stations were established as presented in the Baseline Monitoring Report. Impact 1-hour TSP monitoring was conducted for three times every 6 days. The Action and Limit Levels of the air quality monitoring stipulated in the EM&A programme for triggering the relevant investigation and follow-up procedures under the programme are provided in Table 2.2. The air quality monitoring schedule involved in the reporting period is provided in Appendix C.
Portable direct reading dust meter was used to carry out the 1-hour TSP monitoring. Details of equipment are given in Table 2.3. The portable direct reading dust meter is calibrated every year against high volume sampler (HVS) to check the validity and accuracy of the results measured by direct reading method. The calibration record of the HVS provided in Appendix B of the Construction Phase Monthly EM&A Report No. 11, and the calibration certificates for portable direct reading dust meter listed in Table 2.3 are still valid. No exceedance of the Action or Limit Level was recorded at all monitoring stations in the reporting period. General meteorological conditions throughout the impact monitoring period were recorded. Wind data including wind speed and wind direction for each monitoring day were collected from the Chek Lap Kok Wind Station. Noise monitoring was conducted at 5 representative monitoring stations in the vicinity of noise sensitive receivers in Tung Chung and villages in North Lantau in accordance with the Manual. Figure 2.1 shows the locations of the monitoring stations and these are described in Table 3.1 below. As described in Section 4.3.3 of the Manual, monitoring at NM2 will commence when the future residential buildings in Tung Chung West Development become occupied. Note: (1) As described in Section 4.3.3 of the Manual, noise monitoring at NM2 will only commence after occupation of the future Tung Chung West Development. In accordance with the Manual, baseline noise levels at the noise monitoring stations were established as presented in the Baseline Monitoring Report. Impact noise monitoring was conducted once per week in the form of 30-minute measurements of Leq, L10 and L90 levels recorded at each monitoring station between 0700 and 1900 on normal weekdays. The Action and Limit Levels of the noise monitoring stipulated in the EM&A programme for triggering the relevant investigation and follow-up procedures under the programme are provided in Table 3.2. The construction noise monitoring schedule involved in the reporting period is provided in Appendix C.
Note: (i) Reduced to 70dB(A) for school and 65dB(A) during school examination periods. Noise monitoring was performed using sound level meter at each designated monitoring station. The sound level meters deployed comply with the International Electrotechnical Commission Publications 651:1979 (Type 1) and 804:1985 (Type 1) specifications. Acoustic calibrator was used to check the sound level meters by a known sound pressure level for field measurement. Details of equipment are given in Table 3.3. Calibration certificates of the sound level meters and acoustic calibrators used in the noise monitoring listed in Table 3.3 are still valid. The calibration certificates of the integrated sound level meters used in this reporting period are provided in Appendix E.
(ii) Reduced to 65 dB(A) during school examination periods at NM4. No school examination took place in the reporting period. As the construction activities were far away from the monitoring stations, major sources of noise dominating the monitoring stations observed during the construction noise impact monitoring were road traffic noise at NM1A, helicopter and aircraft noise at NM3A, aircraft noise and student activities at NM4, aircraft and helicopter noise at NM5, and noise from aircraft, helicopter, marine vessel, and construction activities from other projects at NM6 in this reporting period. Water quality monitoring was conducted at a total of 22 water quality monitoring stations, comprising 12 impact (IM) stations, 7 sensitive receiver (SR) stations and 3 control stations in the vicinity of water quality sensitive receivers around the airport island in accordance with the Manual. Table 4.1 describes the details of the monitoring stations. Figure 3.1 shows the locations of the monitoring stations. (1) The seawater intakes of SR1 for the future HKBCF is not yet in operation, hence no water quality impact monitoring was conducted at this station. The future permanent location for SR1 during impact monitoring is subject to finalisation after the HKBCF seawater is commissioned. (2) Details of selection criteria for the two heavy metals for early regular DCM monitoring refer to the Detailed Plan on Deep Cement Mixing available on the dedicated 3RS website (http://env.threerunwaysystem.com/en/ep-submissions.html). DCM specific water quality monitoring parameters (total alkalinity and heavy metals) were only conducted at C1 to C3, SR2, and IM1 to IM12. (3) According to the Baseline Water Quality Monitoring Report, C3 station is not adequately representative as a control station of impact/ SR stations during the flood tide. The control reference has been changed from C3 to SR2 from 1 September 2016 onwards. (4) The monitoring location for SR8 is subject to further changes due to silt curtain arrangements and the progressive relocation of this seawater intake. In accordance with the Manual, baseline water quality levels at the abovementioned representative water quality monitoring stations were established as presented in the Baseline Water Quality Monitoring Report. General water quality monitoring and early regular DCM water quality monitoring were conducted three days per week, at mid-flood and mid-ebb tides, at the 22 water quality monitoring stations during the reporting period. The sea conditions varied from calm to rough, and the weather conditions varied from sunny to rainy during the monitoring period. The water quality monitoring schedule for the reporting period is updated and provided in Appendix C. The ebb tide monitoring session on 30 September 2017 was cancelled due to hoisting Thunderstorm Signal and adverse sea condition. The Action and Limit Levels for general water quality monitoring and regular DCM monitoring stipulated in the EM&A programme for triggering the relevant investigation and follow-up procedures under the programme are presented in Table 4.2. The control and impact stations during flood tide and ebb tide for general water quality monitoring and regular DCM monitoring are presented in Table 4.3. (1) For DO measurement, non-compliance occurs when monitoring result is lower than the limits. (2) For parameters other than DO, non-compliance of water quality results when monitoring results is higher than the limits. (3) Depth-averaged results are used unless specified otherwise. (5) The Action and Limit Levels for the two representative heavy metals chosen will be the same as that for the intensive DCM monitoring. ^1 As per findings of Baseline Water Quality Monitoring Report, the control reference has been changed from C3 to SR2 from 1 Sep 2016 onwards. Table 4.4 summarises the equipment used for monitoring of specific water quality parameters under the impact water quality monitoring programme. Other equipment used as part of the impact water quality monitoring programme are listed in Table 4.5. Water quality monitoring samples were taken at three depths (at 1m below surface, at mid-depth, and at 1m above bottom) for locations with water depth >6m. For locations with water depth between 3m and 6m, water samples were taken at two depths (surface and bottom). For locations with water depth <3m, only the mid-depth was taken. Duplicate water samples were taken and analysed. The water samples for all monitoring parameters were collected, stored, preserved and analysed according to the Standard Methods, APHA 22nd ed. and/or other methods as agreed by the EPD. In-situ measurements at monitoring locations including temperature, pH, DO, turbidity, salinity and water depth were collected by equipment listed in Table 4.4 and Table 4.5. Water samples for heavy metals and SS analysis were stored in high density polythene bottles with no preservative added, packed in ice (cooled to 4 ºC without being frozen), delivered to the laboratory within 24 hours of collection. All in-situ monitoring instrument were checked, calibrated and certified by a laboratory accredited under HOKLAS before use. Responses of sensors and electrodes were checked with certified standard solutions before each use. Wet bulb calibration for a DO meter was carried out before commencement of monitoring and after completion of all measurements each day. Calibration was not conducted at each monitoring location as daily calibration is adequate for the type of DO meter employed. A zero check in distilled water was performed with the turbidity probe at least once per monitoring day. The probe was then calibrated with a solution of known NTU. In addition, the turbidity probe was calibrated at least twice per month to establish the relationship between turbidity readings (in NTU) and levels of suspended solids (in mg/L). Accuracy check of the digital titrator was performed at least once per monitoring day. Calibration certificates of the monitoring equipment used in the reporting period listed in Table 4.4 are still valid. Calibration certificates updated in the reporting period are provided in Appendix E.
Analysis of SS and heavy metals have been carried out by a HOKLAS accredited laboratory, ALS Technichem (HK) Pty Ltd (Reg. No. HOKLAS 066). Sufficient water samples were collected at all the monitoring stations for carrying out the laboratory SS and heavy metals determination. The SS and heavy metals determination works were started within 24 hours after collection of the water samples. The analysis of SS and heavy metals have followed the standard methods summarised in Table 4.6. The QA/QC procedures for laboratory measurement/ analysis of SS and heavy metals were presented in Appendix F of the Construction Phase Monthly EM&A Report No.8. The water quality monitoring results for DO, turbidity, total alkalinity, and chromium obtained during the reporting period did not trigger their corresponding Action and Limit Levels stipulated in the EM&A programme for triggering the relevant investigation and follow-up procedures under the programme if being exceeded. For SS and nickel, some of the testing results exceeded the relevant Action or Limit Levels, and the corresponding investigations were conducted accordingly. It should be noted that Severe Tropical Storm Mawar hit Hong Kong during the reporting period. The water quality monitoring results might be affected by this weather event. Detailed analysis of the exceedances are presented in Section 4.5.2. During the reporting period, water quality monitoring was conducted at 12 IM stations, 7 SR stations, and 3 control stations in accordance with the Manual. The purpose of water quality monitoring at the IM stations is to promptly capture any potential water quality impact from the Project before it could become apparent at sensitive receivers (represented by the SR stations). During the monitoring period, testing results exceeding the corresponding Action or Limit Levels were recorded on 5 monitoring days. Details of the exceedance cases are presented below. 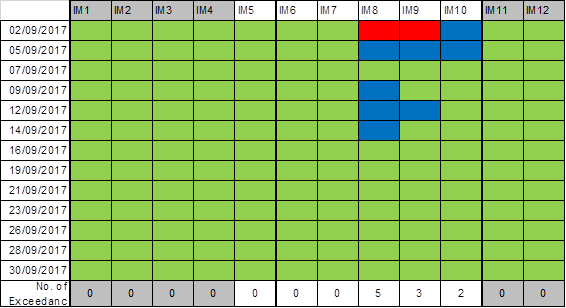 Table 4.7 presents a summary of the SS compliance status at IM and SR stations during mid-ebb tide for the reporting period. Note: Detailed results are presented in Appendix D.
An exceedance of Action Level was recorded on one monitoring day. As the exceedance occurred at a station located downstream of the Project, which might be affected by Project’s construction activities, exceedance investigation was carried out. As part of the investigation on downstream exceedance event, details of the Project’s marine construction activities on the concerned monitoring day was collected, as well as any observations during the monitoring. The findings are summarized in Table 4.8. * This refers to the approximate distance between the marine construction works and the nearest monitoring stations with exceedance. According to the investigation findings, it was confirmed that both DCM and sand blanket laying activities were operating normally with silt curtains deployed as additional measures. The silt curtains were maintained properly. For the exceedance at IM11 on 9 September 2017, the exceedance appeared to be an isolated case with no observable temporal and spatial trend to indicate any effect due to Project activities. As there is no evidence of SS release due to project activities from site observations and all mitigation measures were carried out properly, the exceedance was possibly due to natural fluctuation in the vicinity of the monitoring station, and considered not due to the Project. Table 4.9 presents a summary of the SS compliance status at IM and SR stations during mid-ebb tide for the reporting period. An exceedance of Action Level was recorded on one monitoring day. However, the exceedance occurred at a monitoring station which was located upstream of the Project during flood tide, that would unlikely be affected by the Project. Therefore, the exceedance was possibly due to natural fluctuation in the vicinity of the monitoring station, and considered not due to the Project. Table 4.10 presents a summary of the nickel compliance status at IM stations during mid-flood tide for the reporting period. Exceedances of Action or Limit Levels were recorded on five monitoring days. Standby Signal No. 1 was in force when exceedances were recorded on 2 September 2017. As the exceedances occurred at stations located downstream of the Project, exceedance investigation on the exceedance events was carried out. As part of the investigation on downstream exceedance events, details of the Project’s marine construction activities on concerned monitoring days were collected, as well as any observations during the monitoring. The findings are summarized in Table 4.11. For the exceedances at IM8 on 9 and 14 September 2017, the exceedances appeared to be an isolated case with no observable spatial trend to indicate any effect due to Project activities. No exceedance was recorded at other downstream monitoring stations, including IM7 and IM9, which were also located around 500 m from active DCM works during the same tide. Based on these findings, the exceedance was considered not due to the Project. For the exceedances at IM8 to IM10 on 2, 5 and 12 September 2017, it is noted that no SS exceedance was recorded in the same tide and the concentration (5 – 13 mg/L) was well below the Action and Limit Levels. Nickel is a representative heavy metal that indicates the potential for release of contaminants from Contaminated Mud Pits (CMPs) due to the disturbance of marine sediment within CMP by DCM activities. Elevated nickel concentrations due to these activities should be associated with similar elevated SS levels. However, the low SS levels at impact stations indicates that the active DCM works had limited or insignificant effect on downstream water quality. Based on these findings the exceedances were considered not due to the Project and may be due to natural fluctuation or other sources not related to the Project. Based on the findings of the exceedance investigations, it is concluded that the exceedances were not due to the Project. Hence no SR was adversely affected by the Project. All required actions under the Event and Action Plan were followed. Exceedances appeared to be due to natural fluctuation or other sources not related to the Project. Nevertheless, recognising that the IM stations represent a ‘first line of defence’, the non-project related exceedances identified at IM stations were attended to as a precautionary measure. As part of the EM&A programme, the construction methods and mitigation measures for water quality will continue to be monitored and opportunities for further enhancement will continue to be explored and implemented where possible, to strive for better protection of water quality and the marine environment. In the meantime, the contractors were reminded to implement and maintain all mitigation measures during weekly site inspection and regular environmental management meetings. These include maintaining mitigation measures for DCM works and sand blanket laying works properly as recommended in the Manual. In accordance with the Manual, the waste generated from construction activities was audited once per week to determine if wastes are being managed in accordance with the Waste Management Plan (WMP) prepared for the Project, contract-specific WMP, and any statutory and contractual requirements. All aspects of waste management including waste generation, storage, transportation and disposal were assessed during the audits. The Action and Limit Levels of the construction waste are provided in Table 5.1. Weekly monitoring on all works contracts were carried out by the ET to check and monitor the implementation of proper waste management practices during the construction phase. Recommendations including provision of drip trays and proper chemical waste storage, as well as regular segregation and removal of waste. The contractors had taken actions to implement the recommended measures. Based on the updated information, 75kg and 7800L of chemical waste were collected by licensed chemical waste collector in August 2017. According to the Contractor’s information, about 614m3 of excavated materials were produced from the HDD launching site under P560(R) in the reporting period. The generated excavated materials were temporarily stored at the stockpiling area. The excavated material will be reused in the Project. In addition, metal and paper were recycled in the reporting month. Around 137 tonnes of general refuse was disposed of to the designated landfill, 2kg and 1200L of chemical waste were collected by licensed chemical waste collector in September 2017. Besides, around 25 m3 of Construction and Demolition (C&D) materials was reused in another contract. No exceedances of the Action or Limit Levels were recorded in the reporting period. In accordance with the Manual, CWD monitoring by small vessel line-transect survey supplemented by land-based theodolite tracking and passive acoustic monitoring should be conducted during construction phase. The small vessel line-transect survey as proposed in the Manual should be conducted at a frequency of two full surveys per month while land-based theodolite tracking should be conducted at a frequency of one day per month per station during the construction phase. In addition to the land-based theodolite tracking required for impact monitoring as stipulated in the Manual, supplemental theodolite tracking surveys have also been conducted during the implementation for the SkyPier HSF diversion and speed control in order to assist in monitoring the effectiveness of these measures, i.e. in total twice per month at the Sha Chau station and three times per month at the Lung Kwu Chau station. The Action Level (AL) and Limit Level (LL) for CWD monitoring were formulated by the action response approach using the running quarterly dolphin encounter rates STG and ANI derived from the baseline monitoring data, as presented in the CWD Baseline Monitoring Report. The derived values of AL and LL for CWD monitoring were summarized in Table 6.1. ^Limit Level – two consecutive running quarters mean both the running quarterly encounter rates of the preceding month August 2017 (calculated by data from June 2017 to August 2017) and the running quarterly encounter rates of this month (calculated by data from July 2017 to September 2017). Small vessel line-transect surveys were conducted along the transects covering Northeast Lantau (NEL), Northwest Lantau (NWL), Airport West (AW), West Lantau (WL) and Southwest Lantau (SWL) areas as proposed in the Manual, which are consistent with the Agriculture, Fisheries and Conservation Department (AFCD) long-term monitoring programme (except the addition of AW). The AW transect has not been previously surveyed in the AFCD programme due to the restrictions of HKIA Approach Area, nevertheless, this transect was established during the EIA of the 3RS Project and refined in the Manual with the aim to collect project specific baseline information within the HKIA Approach Area to fill the data gap that was not covered by the AFCD programme. This provided a larger sample size for estimating the density, abundance and patterns of movements in the broader study area of the project. The planned vessel survey transect lines follow the waypoints set for construction phase monitoring as proposed in the Manual and depicted in Figure 6.1 with the waypoint coordinates of all transect lines given in Table 6.2, which are subject to on-site refinement based on the actual survey conditions and constraints. Land-based theodolite tracking stations were set up at two locations, one facing east/south/west on the southern slopes of Sha Chau (SC), and the other facing north/northeast/northwest at Lung Kwu Chau (LKC). The stations (D and E) are depicted in Figure 6.2 and shown in Table 6.3 with position coordinates, height of station and approximate distance of consistent theodolite tracking capabilities for CWD. Small vessel line-transect surveys provided data for density and abundance estimation and other assessments using distance-sampling methodologies, specifically, line-transect methods. 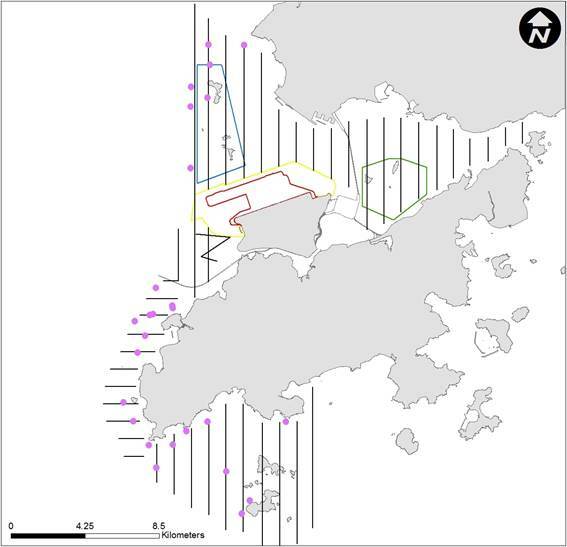 The surveys involved small vessel line-transect data collection and have been designed to be similar to, and consistent with, previous surveys for the AFCD for their long-term monitoring of small cetaceans in Hong Kong. The survey was designed to provide systematic, quantitative measurements of density, abundance and habitat use. ● Secondary transect lines: transect lines connecting between the primary transect lines and crossing islands. All data collected on both primary and secondary transect lines were used for analysis of sighting distribution, group size, activities including association with fishing boat, and mother-calf pair. Only on-effort data collected under conditions of Beaufort 0-3 and visibility of approximately 1200 m or beyond were used for analysis of the CWD encounter rates. A 15-20 m vessel with a flying bridge observation platform about 4 to 5 m above water level and unobstructed forward view, and a team of three to four observers were deployed to undertake the surveys. Two observers were on search effort at all times when following the transect lines with a constant speed of 7 to 8 knots (i.e. 13 to 15 km per hour), one using 7X handheld binoculars and the other using unaided eyes and recording data. During on-effort survey periods, the survey team recorded effort data including time, position (waypoints), weather conditions (Beaufort sea state and visibility) and distance travelled in each series with assistance of a handheld GPS device. The GPS device also continuously and automatically logged data including time, position (latitude and longitude) and vessel speed throughout the entire survey. When CWDs were seen, the survey team was taken off-effort, the dolphins were approached and photographed for photo-ID information (using a Canon 7D [or similar] camera and long 300 mm+ telephoto lens), then followed until they were lost from view. At that point, the boat returned (off effort) to the survey line and began to survey on effort again. Focal follows of dolphins were conducted where practicable (i.e. when individual dolphins or small stable groups of dolphins with at least one member that could be readily identifiable with unaided eyes during observations and weather conditions are favourable). These involved the boat following (at an appropriate distance to minimize disturbance) an identifiable individual dolphin for an extended period of time, and collecting detailed data on its location, behaviour, response to vessels, and associates. CWDs can be identified by their unique features like presence of scratches, nick marks, cuts, wounds, deformities of their dorsal fin and distinguished colouration and spotting patterns. When CWDs were observed, the survey team was taken off-effort, the dolphins were approached and photographed for photo-ID information (using a Canon 7D [or similar] camera and long 300 mm+ telephoto lens). The survey team attempted to photo both sides of every single dolphin in the group as the colouration and spotting pattern on both sides may not be identical. The photos were taken at the highest available resolution and stored on Compact Flash memory cards for transferring into a computer. All photos taken were initially examined to sort out those containing potentially identifiable individuals. These sorted-out images would then be examined in detail and compared to the CWD photo-identification catalogue established for 3RS during the baseline monitoring stage. Land-based monitoring obtains fine-scale information on the time of day and movement patterns of the CWDs. A digital theodolite (Sokkia/Sokkisha Model DT5 or similar equipment) with 30-power magnification and 5-s precision was used to obtain the vertical and horizontal angle of each dolphin and vessel position. Angles were converted to geographic coordinates (latitude and longitude) and data were recorded using Pythagoras software, Version 1.2. This method delivers precise positions of multiple spatially distant targets in a short period of time. The technique is fully non-invasive, and allows for time and cost-effective descriptions of dolphin habitat use patterns at all times of daylight. Three surveyors (one theodolite operator, one computer operator, and one observer) were involved in each survey. Observers searched for dolphins using unaided eyes and handheld binoculars (7X50). Theodolite tracking sessions were initiated whenever an individual CWD or group of CWDs was located. Where possible, a distinguishable individual was selected, based on colouration, within the group. The focal individual was then continuously tracked via the theodolite, with a position recorded each time the dolphin surfaced. In case an individual could not be positively distinguished from other members, the group was tracked by recording positions based on a central point within the group whenever the CWD surfaced. Tracking continued until animals were lost from view; moved beyond the range of reliable visibility (>1-3 km, depending on station height); or environmental conditions obstructed visibility (e.g., intense haze, Beaufort sea state >4, or sunset), at which time the research effort was terminated. In addition to the tracking of CWD, all vessels that moved within 2-3 km of the station were tracked, with effort made to obtain at least two positions for each vessel. Theodolite tracking included focal follows of CWD groups and vessels. Priority was given to tracking individual or groups of CWD. The survey team also attempted to track all vessels moving within 1 km of the focal CWD. Within this reporting period, two complete sets of small vessel line-transect surveys were conducted on the 11th, 12th, 13th, 14th, 18th, 19th, 20th and 21st September 2017, covering all transects in NEL, NWL, AW, WL and SWL survey areas for twice. A total of around 443.95 km of survey effort was collected from these surveys, with around 88.93% of the total survey effort being conducted under favourable weather condition (i.e. Beaufort Sea State 3 or below with favourable visibility). Details of the survey effort are given in Appendix D.
In September 2017, 26 groups of CWDs with 79 individuals were sighted. Amongst these sightings, 21 groups of CWDs with 70 animals were recorded during on-effort search under favourable weather conditions (i.e. Beaufort Sea State 3 or below with favourable visibility). Details of cetacean sightings are presented in Appendix D.
Distribution of all CWD sightings recorded in September 2017 is illustrated in Figure 6.3. There were seven sightings of CWDs recorded in NWL, with the majority of these sightings recorded around Lung Kwu Chau, while one sighting located near Black Point and another located at the southwestern corner of Sha Chau and Lung Kwu Chau Marine Park. 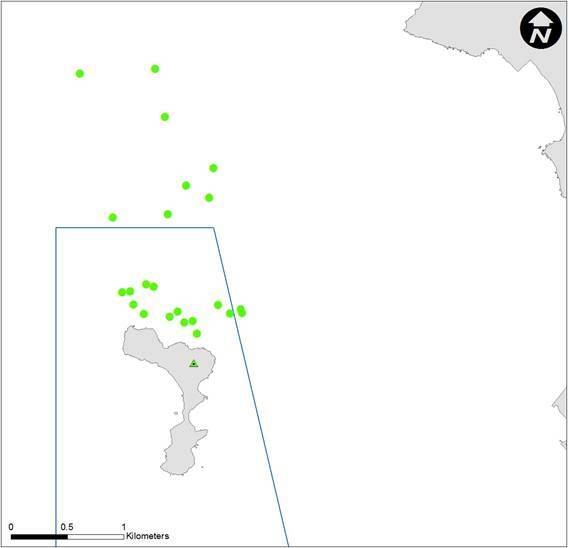 In WL, CWDs were recorded from Tai O to the waters around Tsin Yue Wan Camp Site. In SWL, CWD sightings were recorded along the coastal waters Fan Lau to Lo Kei Wan with a few sightings located around Soko Islands. No sightings of CWDs were recorded in NEL and also the vicinity of or within the 3RS land-formation footprint. Remarks: Please note that there are 26 pink circles on the map indicating the sighting locations of CWD. Some of them were very close to each other and therefore appear overlapped on this distribution map. In September 2017, a total of around 394.79 km of survey effort were conducted under Beaufort Sea State 3 or below with favourable visibility, whilst a total number of 21 on-effort sightings with a total number of 70 dolphins from on-effort sightings were obtained under such condition. Calculation of the encounter rates in September 2017 are shown in Appendix D.
For the running quarter of the reporting period (i.e., from July 2017 to September 2017), a total of around 1136.95 km of survey effort were conducted under Beaufort Sea State 3 or below with favourable visibility, whilst a total number of 76 on-effort sightings and a total number of 227 dolphins from on-effort sightings were obtained under such condition. Calculation of the running quarterly encounter rates are shown in Appendix D.
The STG and ANI of CWD in the whole survey area (i.e. NEL, NWL, AW, WL and SWL) during the month of September 2017 and during the running quarter are presented in Table 6.4 below and compared with the Action Level. The running quarterly encounter rates STG and ANI did not trigger the Action Level (i.e., remained above the Action Level). *Running quarterly encounter rates STG & ANI were calculated from data collected in the reporting period and the two preceding survey months, i.e. the data from July 2017 to September 2017, containing six sets of transect surveys for all monitoring areas. In September 2017, 26 groups of CWDs with 79 individuals were sighted, and the average group size of CWDs was 3.04 individuals per group. The number of sightings with small group size (i.e. 1-2 individuals) was 13 while that of medium group size (i.e. 3-9) was 12. One large CWD group (i.e. 10 or more individuals) was recorded in this reporting period. Five out of 26 sightings of CWDs were recorded engaging in feeding activities in September 2017, whilst none of these sightings were associated with operating fishing boat. In September 2017, three sightings of CWDs were recorded with the presence of mother-and-unspotted juvenile or mother-and-spotted juvenile pairs. These three sightings were recorded in NWL and WL. In September 2017, a total number of 33 different CWD individuals were identified for totally 43 times. A summary of photo identification works is presented in Table 6.5. Representative photos of these individuals are given in Appendix D.
Land-based theodolite tracking surveys were conducted at LKC on 6th, 18th and 27th September 2017 and at SC on 22nd and 28th September 2017, with a total of five days of land-based theodolite tracking survey effort accomplished in this reporting period. A total number of 23 CWD groups were tracked at LKC station during the surveys. Information of survey effort and CWD groups sighted during these land-based theodolite tracking surveys are presented in Table 6.6. Details of the survey effort and CWD groups tracked are presented in Appendix D. The first sighting locations of CWD groups tracked at LKC station during land-based theodolite tracking surveys in September 2017 were depicted in Figure 6.4. No CWD group was sighted from SC station in this reporting month. Underwater acoustic monitoring using Passive Acoustic Monitoring (PAM) should be undertaken during land formation related construction works. In this reporting period, the Ecological Acoustic Recorder (EAR) has been remained underwater and positioned at south of Sha Chau Island inside the SCLKCMP with 20% duty cycle (Figure 6.5). The EAR deployment is generally for 4-6 weeks prior to data retrieval for analysis. Acoustic data is reviewed to give an indication of CWDs occurrence patterns and to obtain anthropogenic noise information simultaneously. Analysis (by a specialized team of acousticians) involved manually browsing through every acoustic recording and logging the occurrence of dolphin signals. All data will be re-played by computer as well as listened to by human ears for accurate assessment of dolphin group presence. As the period of data collection and analysis takes more than two months, PAM results could not be reported in monthly intervals. During the reporting period, silt curtains were in place by the contractors for sand blanket laying works, in which dolphin observers were deployed by each contractor in accordance with the Marine Mammal Watching Plan (MMWP). Teams of at least two dolphin observers were deployed at 13 to 16 dolphin observation stations by the contractors for continuous monitoring of the Dolphin Exclusion Zone (DEZ) by all contractors for DCM works and seawall construction in accordance with the DEZ Plan. Trainings for the proposed dolphin observers on the implementation of MMWP and DEZ monitoring were provided by the ET prior to the aforementioned works, with a cumulative total of 470 individuals being trained and the training records kept by the ET. Observations were recorded on DEZ monitoring in this reporting period during site inspection by the ET and IEC. The contractors had taken actions to implement the recommended measures. From the contractors’ MMWP observation records and DEZ monitoring records, no dolphin or other marine mammals were observed within or around the silt curtains, whilst there was one record of dolphin sighting within the DEZ of DCM works in this reporting period. According to the contractor’s site record, relevant DCM works were suspended in the dolphin sighting event until the DEZ was clear of dolphin for a continuous period of 30 minutes. The contractor’s record was also audited by the ET during site inspection. Details for the implementation of DEZ during the incident of dolphin sighting within the DEZ of DCM works are mentioned in Section 7.4. Audits of acoustic decoupling for construction vessels were carried out during weekly site inspection and the observations are summarised in Section 7.1. Audits of SkyPier high speed ferries route diversion and speed control and construction vessel management are presented in Section 7.2 and Section 7.3 respectively. Detailed analysis of CWD monitoring results collected by small vessel line-transect survey will be provided in future quarterly reports. Detailed analysis of CWD monitoring results collected by land-based theodolite tracking and PAM will be provided in future annual reports after a larger sample size of data has been collected. Monitoring of CWD was conducted with two complete sets of small vessel line-transect surveys and five days of land-based theodolite tracking survey effort as scheduled. The running quarterly encounter rates STG and ANI in the reporting period did not trigger the Action Level for CWD monitoring. Weekly site inspections of construction works were carried out by the ET to audit the implementation of proper environmental pollution control and mitigation measures for the Project. The weekly site inspection schedule of the construction works is provided in Appendix C. Bi-weekly site inspections were also conducted by the IEC. Observations have been recorded in the site inspection checklists and provided to the contractors together with the appropriate follow-up actions where necessary. The key observations from site inspection and associated recommendations were related to display of licenses and permits at works area, provision and maintenance of drip trays, proper implementation of noise mitigation measures and dust suppression measures, as well as regular segregation of waste. In addition, recommendations were also provided during site inspection on barges, which included provision of drip trays and chemical waste storage, implementation of dust suppression and runoff prevention measures, implementation of silt plume mitigation and prevention measures, ensuring the effectiveness of silt curtains, and implementation of wastewater collection and treatment. A summary of implementation status of the environmental mitigation measures for the construction phase of the Project during the reporting period is provided in Appendix B. The Marine Travel Routes and Management Plan for High Speed Ferries of SkyPier (the SkyPier Plan) was submitted to the Advisory Council on the Environment (ACE) for comment and subsequently submitted to and approved by EPD in November 2015 under EP Condition 2.10. The approved SkyPier Plan is available on the dedicated website of the Project. In the SkyPier Plan, AAHK has committed to implementing the mitigation measure of requiring high speed ferries (HSFs) of SkyPier travelling between HKIA and Zhuhai / Macau to start diverting the route with associated speed control across the area, i.e. Speed Control Zone (SCZ), with high CWD abundance. The route diversion and speed restriction at the SCZ have been implemented since 28 December 2015. Key audit findings for the SkyPier HSFs travelling to/from Zhuhai and Macau against the requirements of the SkyPier Plan during the reporting period are summarized in Table 7.1. The daily movements of all SkyPier HSFs in September 2017 (i.e., 70 to 87 daily movements) were within the maximum daily cap of 125 daily movements. Status of compliance with the annual daily average of 99 movements will be further reviewed in the annual EM&A Report. In total, 580 ferry movements between HKIA SkyPier and Zhuhai / Macau were recorded in September 2017 and the data are presented in Appendix H. No vessel was operated to/from Zhuhai in September 2017 as the pier facility in Zhuhai was damaged due to typhoon in late August 2017. The time spent by the SkyPier HSFs travelling through the SCZ in September 2017 were presented in Figure 7.1. It will take 9.6 minutes to travel through the SCZ when the SkyPier HSFs adopt the maximum allowable speed of 15 knots within the SCZ. Figure 7.1 shows that all of the SkyPier HSFs spent more than 9.6 minutes to travel through the SCZ. Note: Data above the red line indicated that the time spent by the SkyPier HSFs travelling through the SCZ is more than 9.6 minutes, which is in compliance with the SkyPier Plan. One case of minor deviation from the diverted route recorded on 27 August 2017 was followed up after receiving information from the FO. ET’s investigation found that the minor route deviation was due to avoiding floating objects to ensure safety. After that, the HSF had returned to the normal route following the SkyPier Plan. The average speeds taken within the SCZ of all HSFs were within 15 knots (9.6 knots to 14.1 knots), which complied with the SkyPier Plan. The time used by HSFs to travel through SCZ is presented in Figure 7.1. 70 to 87 daily movements (within the maximum daily cap - 125 daily movements). The updated Marine Travel Routes and Management Plan for Construction and Associated Vessel (MTRMP-CAV) was submitted and approved in November 2016 by EPD under EP Condition 2.9. The approved Plan is available on the dedicated website of the Project. Four skipper training sessions were held for contractors’ concerned skippers of relevant construction vessels to familiarize them with the predefined routes; general education on local cetaceans; guidelines for avoiding adverse water quality impact; the required environmental practices / measures while operating construction and associated vessels under the Project; and guidelines for operating vessels safely in the presence of CWDs. The list of all trained skippers was properly recorded and maintained by ET. Two skipper training sessions were held by contractor’s Environmental Officer. Competency test was subsequently conducted with the trained skippers by ET. 15 skippers were trained by ET and 3 skippers were trained by contractor’s Environmental Officer in September 2017. In total, 750 skippers were trained from August 2016 to September 2017. The Marine Surveillance System (MSS) automatically recorded deviation cases such as speeding, entering no entry zone, not traveling through the designated gate. ET conducted checking to ensure the MSS records deviation cases accurately. Deviations such as speeding in the works area, entering from non-designated gates and entering no-entry zones were identified. All the concerned contractors were reminded to comply with the requirements of the MTRMP-CAV during the bi-weekly MTCC audit. 3-month rolling programmes (one month record and three months forecast) for construction vessel activities were received from the contractors in order to help maintain the number of construction and associated vessels on site to a practicable minimal level. The IEC of the Project had performed audit on the compliance of the requirements as part of the EM&A programme. The DEZ Plan was submitted in accordance with EP Condition 3.1 (v) requirement and Section 10.3 of the Updated EM&A Manual, and approved in April 2016 by EPD. The 24-hour DEZs with a 250m radius for marine works were established and implemented by the contractors for DCM works and seawall construction according to their Method Statement for DEZ Monitoring that followed the specifications and requirements of the DEZ Plan. During the reporting period, ET has been notified on one record of dolphin sighting within the DEZ of DCM works by the contractor. ET has checked the dolphin sighting record and the contractor’s site record to audit the implementation of DEZ. Dolphin sighting within the DEZ was recorded on 20 September 2017. The sighting was recorded from a DEZ monitoring station on DCM barge working at Area F1 (geographical coordinates: 22°19.498N, 113°56.135E; refer to Figure 1.2 for the location of works area), with the dolphin group being sighted at 15:04 within the DEZ for once only. DCM installation works on DCM barges within the DEZ were ceased by the contractor, and not resumed until the DEZ was clear of dolphin for a continuous period of at least 30 minutes in accordance with the DEZ Plan. In accordance with the Manual, ecological monitoring shall be undertaken monthly at the Horizontal Directional Drilling (HDD) daylighting location on Sheung Sha Chau Island during the HDD construction works period from August to March to identify and evaluate any impacts with appropriate actions taken as required to address and minimise any adverse impact found. During the reporting period, the monthly ecological monitoring at the HDD daylighting location on Sheung Sha Chau observed that HDD works were ongoing under the Contract P560(R) at the daylighting location, and there was no encroachment of any works upon the egretry area nor any significant disturbance to the egrets on the island by the works. Sign of late nursery activities by two Little Egrets were observed on trees located at the previously identified egretry area where it is at the southern side of Sheung Sha Chau Island. At the HDD daylighting location, neither nest nor breeding activity of bird were found during the monthly ecological monitoring and weekly site inspections in the reporting period. The site photos and location map regarding the monthly ecological monitoring for the HDD works and egretry area are provided in Appendix D for reference. 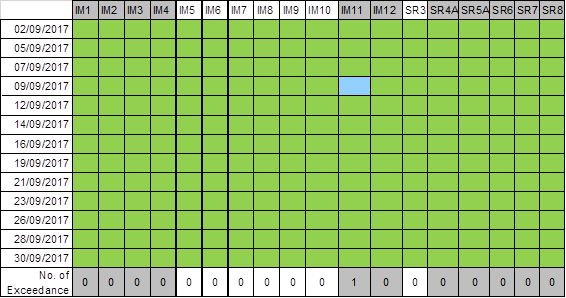 The current status of submissions under the EP up to the reporting period is presented in Table 7.2. During the reporting period, environmental related licenses and permits required for the construction activities were checked. No non-compliance with environmental statutory requirements was recorded. The environmental licenses and permits which are valid in the reporting period are presented in Appendix F.
During the reporting period, a complaint related to sand filling materials of Contract 3206 was received on 5 September 2017. Apart from the investigation conducted by AA under the contractual aspect, investigation on environmental aspect was also conducted by the ET in accordance with the Complaint Management Plan of the Project. Regarding environmental aspect, a maximum of 10% fines content should be adopted for sand blanket in accordance with the EP condition 2.26. The ET had checked and would continue to check the test reports on particle size distribution of sand materials and to witness sand sampling of the Project on a regular basis. To date, no non-compliance against the EP condition of a maximum of 10% fines content was identified. Neither notification of summons nor prosecution was received during the reporting period. Cumulative statistics on complaints, notifications of summons and status of prosecutions are summarized in Appendix G.
● Acoustic decoupling measures for equipment on marine vessels. The implementation of required mitigation measures by the contractors will be monitored by the ET. All the monitoring works for construction dust, construction noise, water quality, construction waste, terrestrial ecology, and CWD were conducted during the reporting period in accordance with the Manual. No exceedance of the Action or Limit Levels in relation to construction dust, construction noise, construction waste and CWD monitoring was recorded in the reporting period. The monthly terrestrial ecology monitoring on Sheung Sha Chau Island observed that HDD works were conducted at the daylighting location and there was no encroachment upon the egretry area nor any significant disturbance to the egrets at Sheung Sha Chau by the works. Weekly site inspections of the construction works were carried out by the ET to audit the implementation of proper environmental pollution control and mitigation measures for the Project. Bi-weekly site inspections were also conducted by the IEC. Observations have been recorded in the site inspection checklists which have been provided to the contractors together with the appropriate follow-up actions where necessary. On the implementation of MMWP, dolphin observers were deployed by the contractors for laying of open sea silt curtain and laying of silt curtains for sand blanket in accordance with the plan. On the implementation of DEZ Plan, dolphin observers at 13 to 16 dolphin observation stations were deployed for continuous monitoring of the DEZ by all contractors for DCM works and seawall construction in accordance with the DEZ Plan. Trainings for the proposed dolphin observers were provided by the ET prior to the aforementioned works, with the training records kept by the ET. From the contractors’ MMWP observation records and DEZ monitoring records, no dolphin or other marine mammals were observed within or around the silt curtains, whilst there was one record of dolphin sighting within the DEZ of DCM works in this reporting period. DCM works were suspended in the dolphin sighting events until the DEZ was clear of dolphin for a continuous period of 30 minutes. The contractor’s record was checked by the ET during site inspection. Audits of acoustic decoupling for construction vessels were also carried out by the ET. On the implementation of the MTRMP-CAV, the MSS automatically recorded the deviation case such as speeding, entering no entry zone, not traveling through the designated gate. ET conducted checking to ensure the MSS records all deviation cases accurately. Training has been provided for the concerned skippers to facilitate them in familiarising with the requirements of the MTRMP-CAV. Deviations including speeding in the works area, entry from non-designated gates, and entering no-entry zones were reviewed by ET. All the concerned captains were reminded by the contractor’s MTCC representative to comply with the requirements of the MTRMP-CAV. ET reminded contractors that all vessels shall avoid entering the no-entry zone, in particular the Brothers Marine Park. 3-month rolling programmes for construction vessel activities, which ensures the proposed vessels are necessary and minimal through good planning, were also received from contractors.